F-117A is a bomber designed to attack the most �difficult� targets. This aircraft have very long combat history (Panama 1989, Gulf War 1991) and this is the first aircraft with STEALTH characteristics ever used. 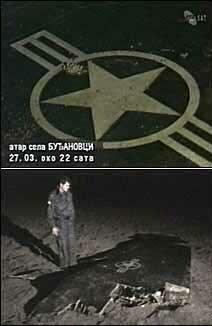 At 8:38 on Saturday, 27.03 1999., the stealth F-117 bomber, flown by Capt Dale Zelco, was shoot down near the village Budjanovci, 64 km from Belgrade.In the 10 minute long report a clear wreckage of the American plane with a crest and the number AF 82 806 was shown.The wreckage was on its back in flames dug into the ground. 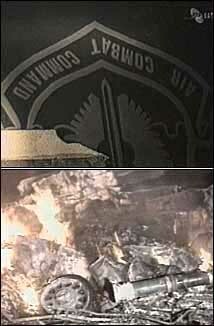 "Certain electronic equipment was recovered from wreckage and stored for further investigation. "(Serbian Radio Television). A few aircraft of this type were destroyed during testing. This is the first aircraft of this type lost in combat due to enemy action. Nobody knows what is the cause of this. Throughout the 78 days of Allied Force some 24 F-117As of the 49th FW flew missions from Aviano AB in Italy and Spangdahlem AB in Germany against strategic targets in Serbia and Kosovo. Remains of this aircraft are now in the Yugoslav Aeronautical museum. Canopy hood is shown on first floor, and rest of wreckage is there too but it is not available to the public. According to the Air Force Monthly magazine two other aircraft of this type were damaged. HOW DID YUGOSLAV ARMY SHOT DOWN THIS STEALT AIRCRAFT? first loss of a STEALTH aircraft in war.